In fast moving world we even take more time or confused to calculate our age, and after the result we wonder how soon the years are passing and at times we our self feel hard to believe how quick we attained this age. Let us see about Age difference tool, instead talking about age and related subjects which might glitch many who tend or pretend to forget their age and remain young ever. You would have seen some are still young sustaining it since a long period. 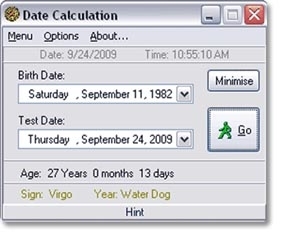 Age difference tool is small and handy tool to calculate your age, sun sign and the Chinese (tradition which has high respective value) year of date of birth by selecting or setting your date of birth in the slot bar and also the current date of test and enter Go. Respective info for the given data will be displayed at the bottom - your age detailing years months and days, sign and Chinese year.